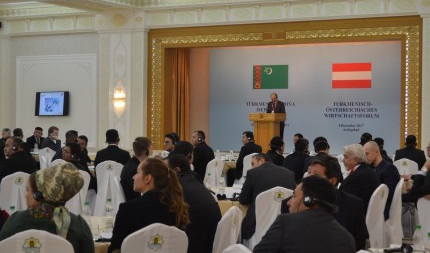 AKIPRESS.COM - A Turkmen-Austrian business forum was held with participation of the Austrian delegation in Ashgabat on December 4, the Turkmen foreign ministry said. Representatives of Austrian government and 24 companies specializing in trade, health, agriculture, transport and logistics, energy, engineering, engineering technology, construction, tourism and other field participated in the forum. The Turkmen side was represented by the specialists from sectoral ministries and departments, the Chamber of Commerce and Industry, the Union of Industrialists and Entrepreneurs, representatives of enterprises and companies producing products oriented for export took part in the forum. The forum objective was to allow the sides to establish a liaison. Austrian delegation expressed interest in building productive ties with the private sector of Turkmen economy.